Naturally, Jerome was motoring outside of the main channel, and we passed very close to the anchored tugs and barges, which also were outside of the main channel. Here are a few pictures. In the foreground, the barge Energy 11101 (hailing from New Orleans, LA) attended by the tug Atlantic Service (also hailing from New Orleans, LA). The barge is 420 feet long, 70 feet wide, displaces 15,163 tons, can carry up to 110,000 barrels of petroleum products, and was built in 1979. The tug is 100.4 feet long, 36.3 feet wide, displaces 198 tons, and was built in 1975. Farther back you can see another tug and barge; I have pictures, below. A closer look at the bow of the barge. The stern of the barge. 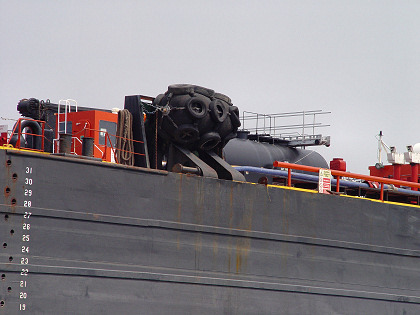 A closer view of one of the giant fenders on the barge (known as a Yokohama fender). It's a fuel barge, so I'm sure you don't want the steel barge to scrape against the pier and make sparks. They use several of these giant fenders, each about the size of a VW Beetle, each surrounded by a web of 15 tires chained together. The next tug and barge, visible in an earlier picture. 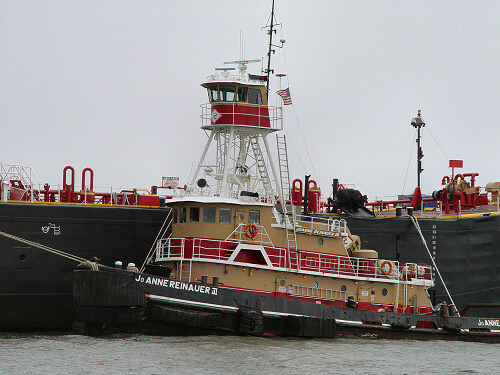 The tug is JoAnne Reinauer III (hailing from New York), and the barge is RTC 501. 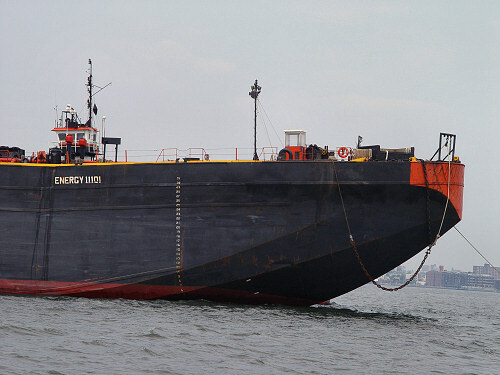 The tug is 100 feet long, 27 feet wide, and displaces 160 tons. 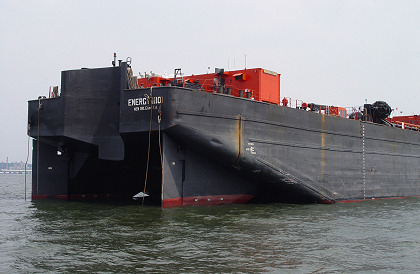 The barge is 338 feet long, 70 feet wide, and can carry 65,000 barrels. A closer view of the tug. Click on the picture to see a bigger version; use your browser's "back" command to return here. Two Staten Island ferries passing. 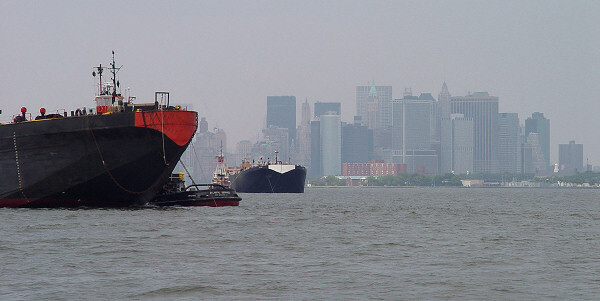 The closer ferry is heading toward Manhattan (to the right), the farther ferry to Staten Island (to the left). Since the ferries are symmetrical, the only way you can tell which way they're going, at least in the picture, is to look for their bow waves. You can ride a Staten Island ferry for free, which is a terrific bargain for a boat cruise through New York Harbor. 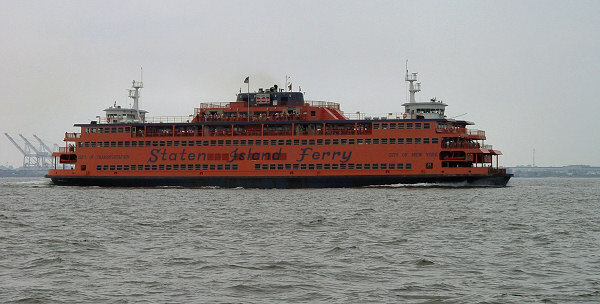 A closer view of the ferry heading for Manhattan. I believe this is the Guy V. Molinari, which is 310 feet long, 70 feet wide, displaces 3,200 tons, and was built in 2003. The ferry had just passed buoy Red 28 in the harbor, so it's at the halfway point in the trip. The trip is 5.2 miles and takes about 25 minutes.